Don’t be surprised when you see your staffs or colleagues playing games during office hours, as they may be playing Microsoft Office learning games which is called as Ribbon Hero 2. 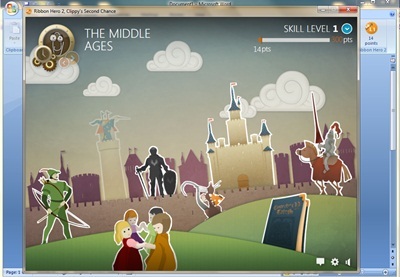 Ribbon Hero 2 is a game which has been designed to help the users to boost their Microsoft Office skills and knowledge. To make it more fun, the games featuring time-traveling adventures Clippy with comic strips, colorful graphics, surprise animations, multiple levels, time travel, upside-down Clippy, space ships, Greek Gods, bow-and-arrow battles and a ton of useful Office features. In Ribbon Hero 2, the players need to follow the Clippy as he explorers different time periods in history and tries to find his way back home (credit greenberg). Each time period, the players will explore a new game boards with challenges that must be complete to get the next level. In each challenge, the players will need to complete the task within one of Office applications such as Microsoft Word, Microsoft Excel, Microsoft PowerPoint and Microsoft OneNote. Besides that, it also features with a hint button to fall back in case the players get struck. Ribbon Hero 2 is now available as a free download from ribbonhero which works well in Microsoft Office 2007 or Microsoft Office 2010. Alternatively, just directly download from the official download link.